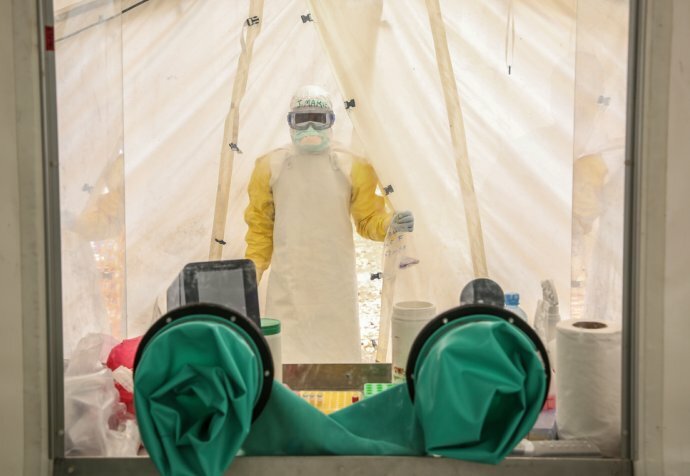 Three years after the end of the major Ebola epidemic in West Africa, a new outbreak was declared on the 1stAugust in the Democratic Republic of Congo (DRC). This epidemic is still uncontrolled and has become the largest ever known in the country. To make sure Ebola treatment centres are secure and set up correctly, MSF mostly employs staff with experience gain from working in Ebola in West Africa. One of them is Alpha Diallo from Guinea who’s a water and sanitation specialist. "I started working with MSF in 2011, well before the 2014 epidemic, in a maternity and paediatric hospital in Conakry, Guinea. When the outbreak was officially declared in mid-March 2014, I started working on an Ebola project in Macenta, Guinea. This was the very beginning of the epidemic and I took the opportunity to learn the protocols and protective measures to follow when working in an Ebola treatment centre. A WatSan (Water and sanitation specialist) oversees infection prevention and control and must ensure that everything going in, but especially coming out of the Ebola treatment centre, is not contaminated. If this is not properly and meticulously done an Ebola treatment centre can easily become a new source of the epidemic's spread. My job is to cut the transmission chains and I make sure no one is infected. Unfortunately, another part of my role often involves having to decontaminate deceased people who have lost their battle against Ebola. "If you do not follow procedures, if you are not careful, you could be responsible for the next epicentre of the epidemic"
I remember when I first went to the high-risk zone of an Ebola treatment centre. I was terrified. I had been working at the treatment centre for some time, but I had tried to delay my first time into the high-risk area a little. After a long day, a logistician noticed that I was nervous about going with him in the high-risk area to change a lamp. He said, "If we don't change this lamp, people can't be treated at night and they might die". That's when I realized I had to put aside my initial fear. I went in and lost fear instantaneously. Today, the PPE (personal protective equipment, usually yellow and white) almost feels like a second skin. With an Ebola epidemic, we can't make any excuses after making a mistake, so I’m often quite direct with my colleagues. If you do not follow procedures, if you are not careful, you could be responsible for the next epicentre of the epidemic. I conduct training with my colleagues to ensure that all procedures are adapted and comply with current standards. My goal is to make sure everyone is aware and attentive, and everything is 100% safe. At this moment, people are reluctant to support the Ebola response from fear and misunderstanding of the disease. I think that's normal. This reluctance and mistrust was still present in Guinea at the end of the epidemic, but there were handwashing points in all public places and private transporters. Taxis were all equipped with hydro-alcoholic solutions to wash their hands. People have become aware of the need for these preventive measures and this change in behaviour is a clear indication of an understanding of the danger of the disease. As for me, I am always ready to help where my help is needed. That's why I'm here. Wherever I need to be there, I will help others save lives.